Weddings and baptisms performed by Santa Muerte leaders are increasingly common in Mexico and the U.S.. For example, Enriqueta Vargas, head of the Templo Santa Muerte Internacional on the outskirts of Mexico City, now performs both rites on a weekly basis. It had always struck me as odd that there were Santa Muerte nuptials and christenings but no funerals. Given that this is a devotion to death, wouldn’t it be logical to offer funerary rites to devotees as well? As his last wish, Erick asked that I pray for him at his funeral. I felt lots of pain and sadness because he was so young and had a three-year old daughter and pregnant wife. I arrived at his mom’s house and looked at him in the coffin, his body was so still and he was so swollen that I barely recognized him. He had been dead for just a few hours so I was able to open his hands and place a small image of Santa Muerte in them. Afterward I recited the prayer and fulfilled his last wish, that of writing “Game Over” on his eyelids. Oh yeah, and after I had placed the Santa Muerte in his hands, they wouldn’t open up anymore. When I finished saying the prayer, his mouth seemed to crack a smile. In the name of God the Father of my Most Holy Death, amen. We beseech you mother to receive our petitions today and we ask that with all your good gifts you console the forgotten ones, brothers and sisters that are not here, those who are at war, those who work, the poor, the rich, the believers, the nonbelievers, the pious, the impious and above all, us your sons and daughters present here and in the hour of our encounter…Amen. 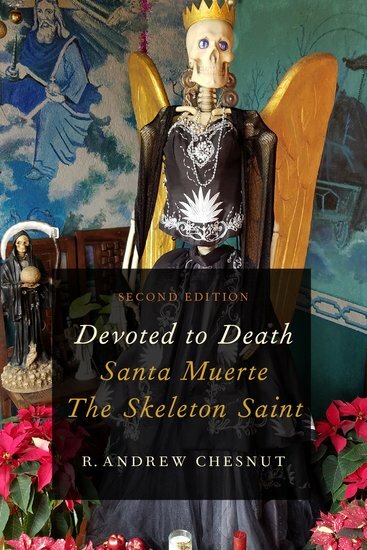 Our Father…Mother of mine, my Santa Muerte, I as the humblest of your children, ask you, beg you to allow me to come to you at the appointed hour without pain, without fear and with faith. We beseech you my lady, we beseech you. Our Father…O Santa Muerte, mother in my adversity, mother in my despair, queen and lady in good and evil. O Santa Muerte, body and blood of your children, patience in inclemency and redemptress of the lord. Implacable, triumphant victor in love, the love that I profess for you, the love that today I give you. Our Father…O my bountiful mother, owner of my soul, in your hand my victory rests and in your cloak my protection, and in your scythe my destiny and in your being all my love. Santa Muerte, White Girl, purity is your gift. Santa Muerte, Black Girl, your warmth is protection. Santa Muerte, Red Girl, your love is a blessing. Santa Muerte, Golden Girl, prosperity is what I receive today in abundance and I give back to you in abundance. Our Father…O Santa Muerte, in silence I remain here awaiting the moment that brings me to you, surrendering myself to your arms, to the support of your love, in your divine lap and embraced by your gift in him, I will rest. Praise the Lord in Heaven, Praise my Mother with glory! Now beloved lady give glory…. to these your children. And calm the storms and adversities of our existence …. With your eternal clemency and your holy gift. I pray to you ….give me full grace in a better plane, to come before God and before you clean ….to come pure and create the incredible !!! to destroy the indestructible !!! to narrate the unspeakable !!! So my eternal Mother, my Santa Muerte, I stand before you today. for you to clarify my mind, my body and my soul and call before my eyes your holy being. “Santa Muerte” your children cry. (3 times) Most Holy Death you reign in my being and you pray for us to have one more day of life, for one more day of light, for tomorrow without darkness, for a night illuminated by a better world. (Kneel down brothers) Full grace to our most holy mother, full grace to our most holy being. (Shut all eyes, both hands to chest) Oh great lady !!! Today I bow my face in reverence to you and shine on earth as the sun shines. Add my voice to your voice, add my self to your self …. I put my life in your hands, and my death at the same time. My soul is with you in body, mind and heart. My mother, Santa Muerte, today I bow down and hold fast towards you to bring sanity, and settle myself today to bring my greatest to you, my mother. My being, my love, my life, my death, my everything. For a world in your favor, against the tireless struggle, the relentless war we must win, doubts, myths, fears, deepest fears, the most sensitive gaps. My eternal mother it is here that I grant you that voice, that voice and feeling that I share here today by a vote of silence, which is a vote for you. (Keep few minutes of silence) My eyes are closed because I’m watching you …. Santa Muerte!!! Lady, pray for us, your devotees, now and at the hour when we encounter you …. AMEN. A healthy mind in a healthy body is the natural and real deliverance for us from evil …. AMEN. Body and mind, mind and body, health of body, clarity of mind, prosperity for my home, abundance for my life! ’Eternity with my death !!! I pray, I and my whole body, to my divine mother and today I realize this prayer, the prayer of my being …. ‘OH MY MOTHER!!! My Saint Death, today we come, the humblest of your children …. to beg …. to implore …. to venerate your most holy being. Most Holy Death descend upon us. Brothers!!! Open your eyes !!! Raise your face !!! Raise your hands to a living God …. who now lives and lies in this home …. through our mother, Most Holy Death, mother in our adversity, mother in our distress…. queen and mistress in good and evil. It covers our body …. elevates our being …. glorifies… magnifies my mother …. GLORY TO GOD THE FATHER, GLORY TO MY MOTHER ‘MY MOST HOLY DEATH !!! AMEN. Stand up all brothers and shake hands in friendship and brotherhood. TO GOD THE FATHER AND MY MOTHER SAINT DEATH THE BLESSING TODAY, TOMORROW AND FOREVER.